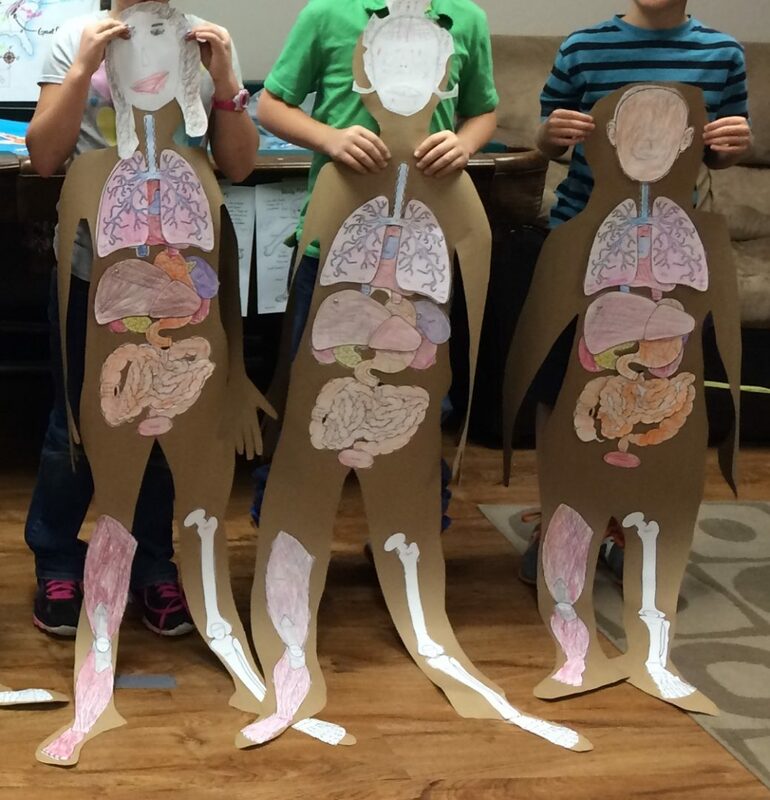 We started creating our life-size paper bodies in science this week! Aren’t they cute? (These are our finished ones from three years ago!) 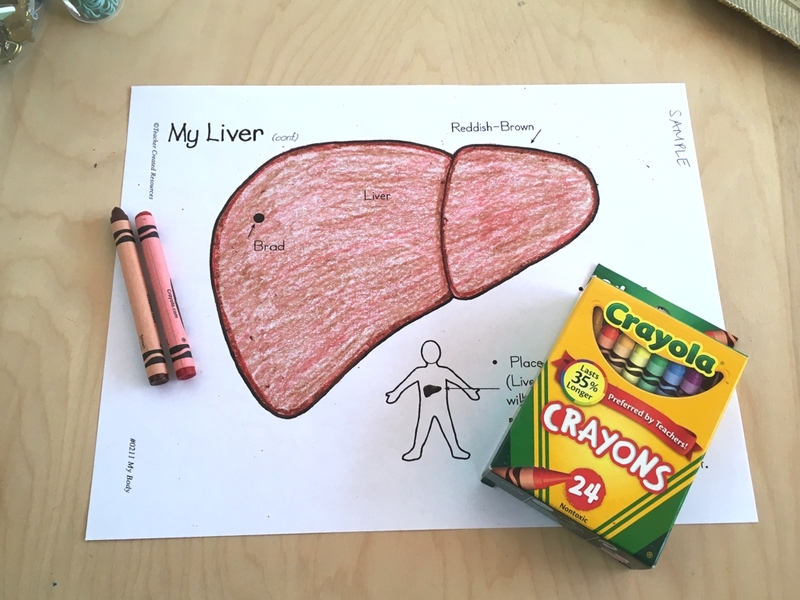 Using the My Body book from Teacher Created Resources, we color a few different organs each week while we learn some interesting facts about each organ. We have a fair number of young children in our community who aren’t reading yet, so I thought it would be nice to have a sample set of pre-colored pages from the My Body book for my tutors to show the class (…and I just like coloring.) I thought I could do this while helping my two sons with school last week, but they kept getting distracted! Instead of completing math sheets, they were watching me color and asking questions about how I was coloring. That’s when it occurred to me that I’d never really taught my kids how to color. It seems kinda funny to think about “teaching” someone to color… Maybe I should instead say that I have never taught my children the secrets to making coloring with crayons look good. I’ve also noticed that older elementary children often decide that crayons are for the little kids and not them. I think this must be because they’ve never learned any advanced crayon techniques. This all convinced me that I should write up a few tips for making your coloring look really nice. The first two tips will work well for all ages and skill levels. The next three are best for students with more skill/experience. You can share these tips with your students and they’ll end up much more pleased with their own coloring work! This is my #1 tip. It will make a bigger impact on the end result than anything else and any age can use it! The changes in direction, shown on the red kidney below, on the left side, are what make it look sloppy, even though I carefully stayed in the lines. 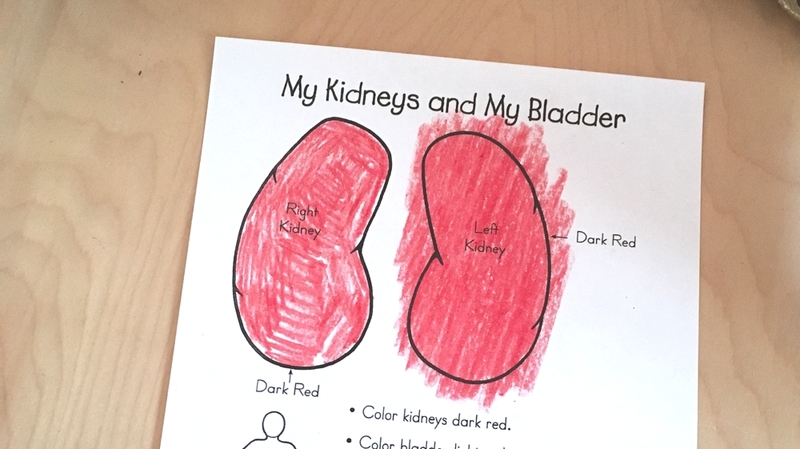 Coloring in a consistent direction, as seen on the other kidney, is easier on the eyes and ends up looking very tidy! If you have a corner or turn that makes it really awkward not to change direction, you can either color using curved lines or color using very small circles instead of lines. Just keep in mind that how you color will always be visible and will create the appearance of texture. Keeping a consistent pressure with the crayon on the paper gives a uniform, pleasing look. If you’re pressing hard, your hands will get tired quickly, so I prefer to press lightly. Interestingly, being aware of how much pressure you’re applying seems to be really hard for younger children. It must be tied to motor skills in some way. It won’t hurt anything to tell them this tip, but if they aren’t implementing it, just let it go. If there are some areas you want to accent, you can press a little harder on the crayon and end up with a darker, more intense color. This is another good reason to color lightly for full coverage. For example, in this picture of the heart below, I pressed harder when tracing the lines within the heart and in the vein and artery openings. I did the same thing when coloring the muscles and the brain. Yes! You can overlap colors using crayons! I like to lightly color the dominate color first and leave a bit of paper exposed for the wax of the second color to cling to. In the liver I colored (below), I started by coloring a layer of red, then I colored some brown on top. Then I colored more red over the top. I find this kind of layering to be really fun! There you have it! Share these tips with your students and all they’re coloring will be beautiful! These are also great tips for coloring with erasable colored pencils!